My father-in-law was born in Tunisia and moved to France at age 10. A decade later, he came to America as a university student at the University of California at Berkeley, where he met my mother-in-law. Other than brief moves to the Philippines and later to Spain, their family spent the bulk of the last three decades in the Bay Area of California. 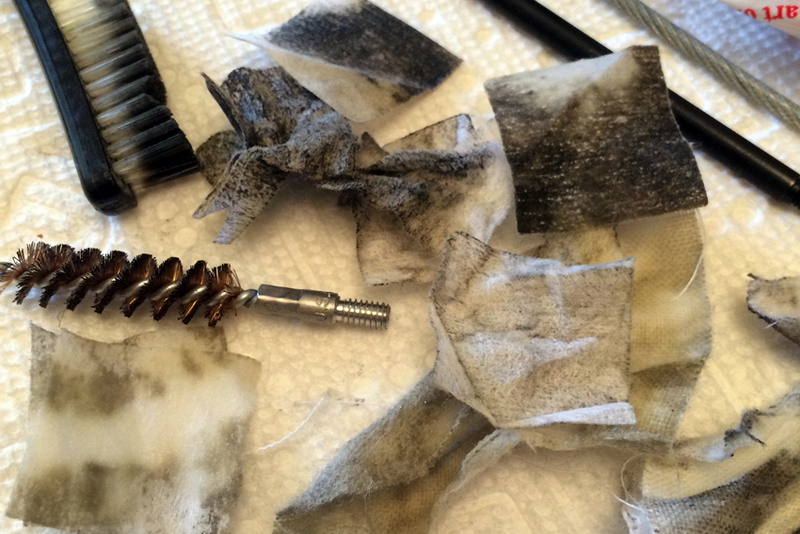 As a result of these experiences, my father-in-law had never held, much less fired a gun. In the area, where I’ve lived on and off since 2000 and where I met my wife, gun ownership is less prevalent than it is in the rest of the country. Though they do exist, gun owners are few and far between here. 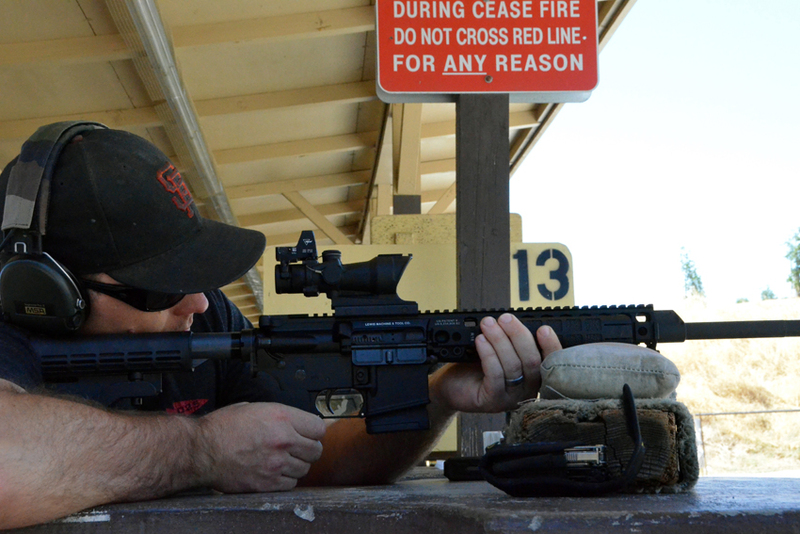 The societal pressure and political climate in the Bay Area tends to keep said gun owners “closeted.” To make a poorly considered analogy, being a gun owner in or around San Francisco is roughly equivalent to being a homosexual in some hypothetical and stereotypical small town in rural America. Still, for purposes of this article, the analogy remains. 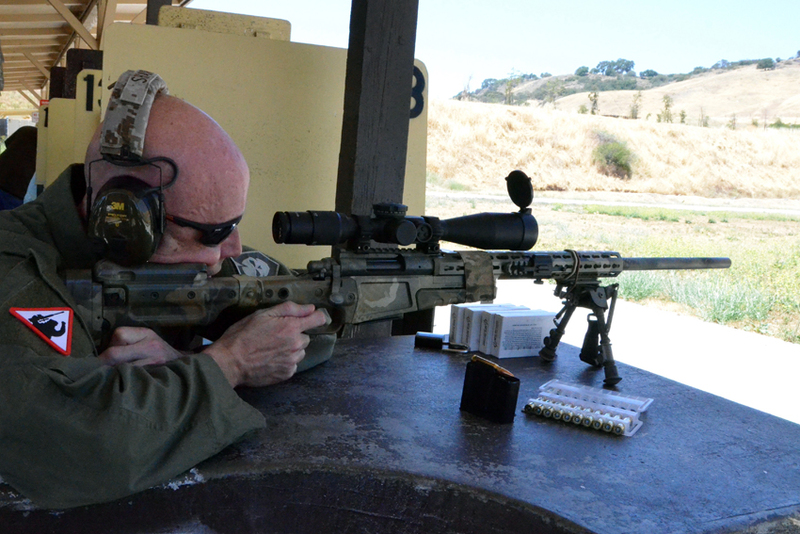 If you’re a recreational shooter, hunter or just a collector of firearms in the Bay Area, chances are you don’t let anyone know. When your neighbors and coworkers find out about it, they look at you differently and may rudely make assumptions, or heap scorn on you for what they perceive to be a heinous violation of the “social contract” demands from all Bay Areans. I’ve taken my wife shooting on a number of occasions, but she hadn’t fired a weapon prior to meeting me. She had been interested in trying it, as she knew it was something that was important to me and it’s now something she’s taken to quite well. I’ve shown her how to fire handguns, shotguns, carbines and long range rifles. She seems to prefer the long range experience the most, with the visceral appeal of the recoil and the feeling of accomplishment that comes with poking accurate holes in paper at distances the naked eye is unable to see. A couple of days before our wedding, my in-laws held a meet and greet dinner at their home to allow my parents to get to know the extended family before the big day. I was seated next to my father-in-law and we ended up on the subject of guns, which was a first for us. Both of her parents knew that I enjoy shooting, as I’ve written articles about it and gone to competitions and training, but we’d never actually discussed it in any detail. During that conversation, my father-in-law’s misconceptions about guns and gun crime became readily apparent. I tried to explain the difference between “semi-automatic” and “fully automatic,” when he told me that he thought it was crazy that anyone could go into a gun store and buy a “fully automatic” rifle without a background check. To him, what seemed to be a minor difference in semantics, is of course a much more severe difference. You can not buy fully automatic weapons at gun stores and absolutely every firearm purchase requires a background check in this state. 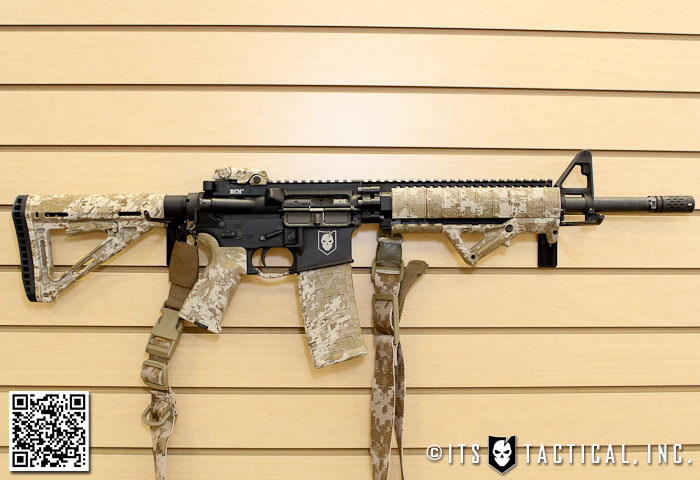 In fact, you can’t easily get fully automatic weapons at all, unless you are willing to pay a prohibitive amount of money in renewed fees to get the appropriate license from the federal government. Not to mention the cost-prohibition of buying select-fire capable weapons. I explained that fully automatic machine guns were not used in crimes and that handguns make up the bulk of gun crime in the United States. I also explained that a substantial portion of handgun crime is committed by people who are already felons and therefore already disallowed to buy weapons in the first place. Felons know they won’t pass a background check, so they get their guns on the black market. Stolen weapons, straw-purchased weapons or home-made weapons don’t require a background check, because they aren’t supposed to be sold in the first place. There are already laws prohibiting the sale, transfer of ownership and possession of these weapons, but for criminals, this isn’t a concern. If you intend to shoot someone in the process of committing a crime, adding on another violation for possession of a weapon you aren’t allowed to have in the first place, is a trivial concern. We then talked a little about crime, its relation to the black market sale of drugs and urban area gang problems, before coming to roughly the same conclusion. In order to solve these problems, new gun laws won’t help. 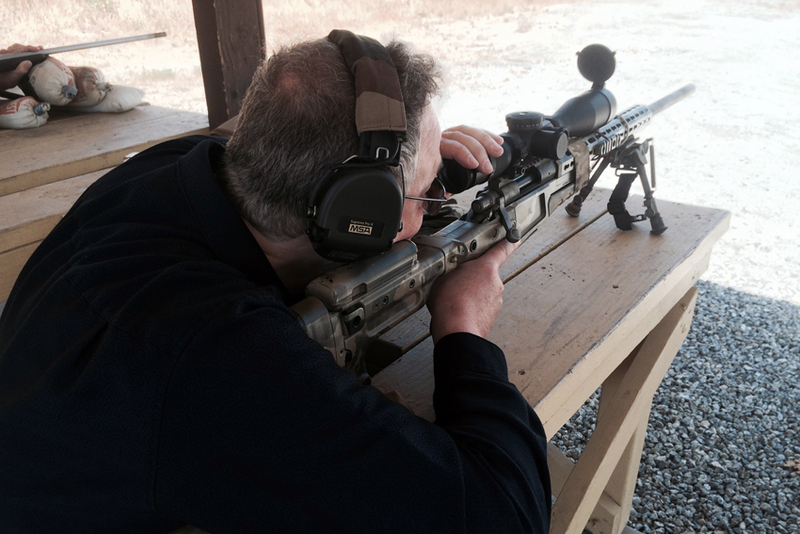 During that conversation, it occurred to me that I should offer to take my father-in-law to the range. I knew his educational background as an engineer was an angle from which I could approach this; the mathematics and engineering involved in both the design and operation of firearms are fascinating, rational, predictable and precise. He said he’d think about going with me some time and I figured that was a step in the right direction. My in-laws gave a toast during our wedding reception and my father-in-law said that he would be willing to go shooting with me, which I found very touching. Not only because it was important to me, but that he agreed to go publicly, in front of his friends and peers from the Bay Area who might frown upon such activities. A little after their toast, Mrs. M, a family friend of theirs, pulled me aside to suggest that I also take her husband on that range trip. Mr. M had been making trips to go shoot with their son in Oregon recently. At first it was behind her back, as she personally believed that only the Police and Military should have guns (and likely still believes that). Mr. M had grown up in Israel and served in the IDF as a young man, so he wasn’t entirely unfamiliar with firearms, but it had been a long time since he’d been shooting regularly. I agreed that it would be good to have him along; I figured the more the merrier. All the better to have someone there that my father-in-law already felt comfortable around, as one’s first visit to a shooting range can be an intimidating experience. 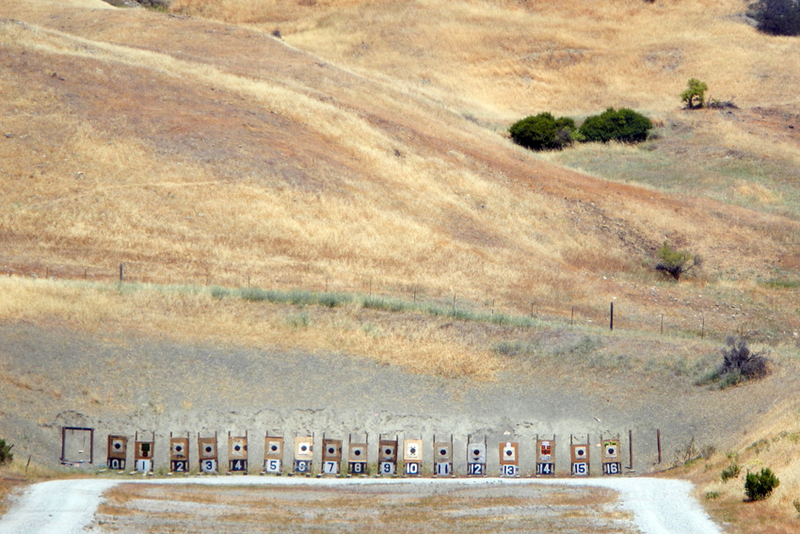 A couple of weeks after the wedding, I started looking for a range in the area that allowed shooting distances greater than 100 yards and found the Santa Clara Field Sports Park, south of San Jose. 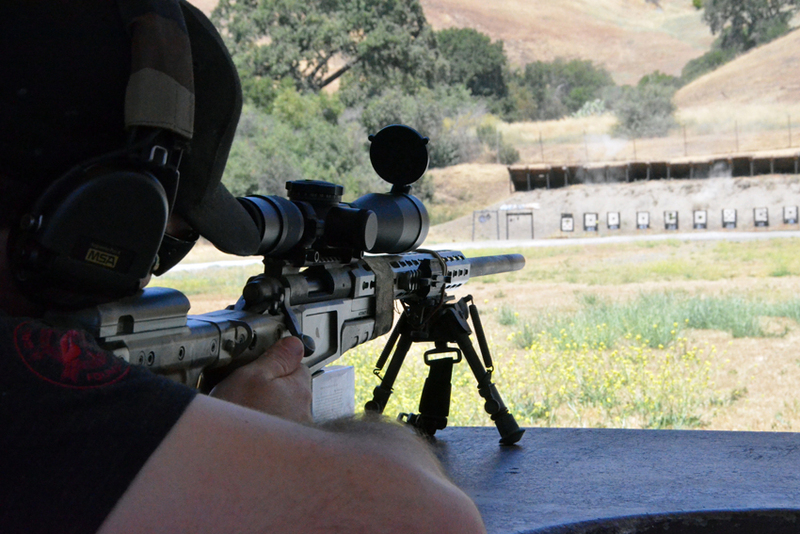 They have a 200 yard range that’s open to the public the fourth Sunday of every month. We confirmed the date between the three of us and I set about assembling the necessary gear. Active hearing protection, sunglasses, spotting scope, shooting mat, ammunition and magazines were all acquired. Last but not least, the Remington 700P in its lovely AICS stock was added and I gave it a thorough cleaning, making sure it was in flawless working condition. We arrived at the Field Sports Park around noon that Sunday and I handed out the hearing protection for the short jaunt from the parking lot to the office. We paid our range fees and filled out our registration cards before heading up the short distance to the 200 yard shooting line. My father-in-law looked out of his element as we were getting back in the car, eyeballing the gentleman next to us in the parking lot. By my guess, he was seven feet-tall and wore a desert tan Punisher skull t-shirt as he prepped his rifle gear for use at the 100 yard line on the tailgate of his F-250. These were my people, but they were alien to my father-in-law. We were assigned two lanes at the 200 yard line, one for bench shooting and one for prone shooting. 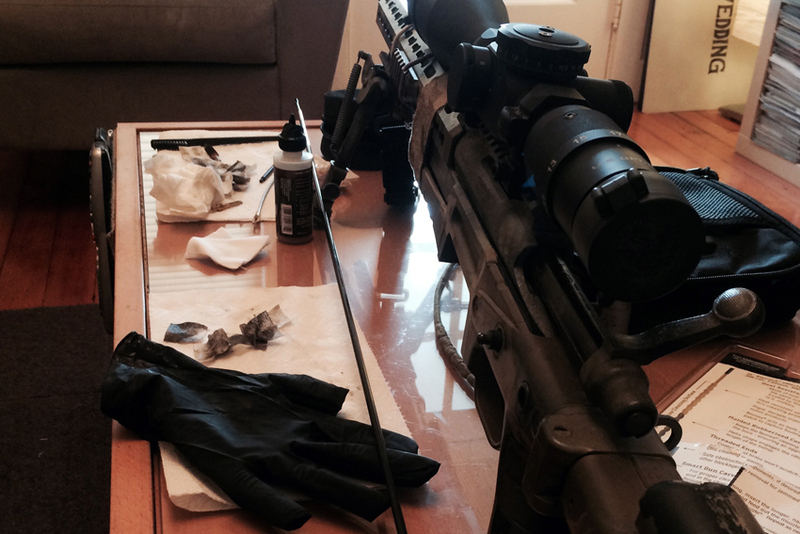 I unpacked the rifle and other gear before running through the four (or five) rules of gun safety. I had emailed both Mr. M and my father-in-law all of this information prior to our trip, but wanted them to understand the rules fully. I also added information on how the range rules worked. I then showed them a round of ammunition and explained the functions of the primer, powder, shell casing and the bullet. I also touched on the basics of ballistics, how rifling works and how the round starts off level, then loses altitude over distance. That brought me to explaining how the scope works and how to make adjustments to the elevation at different distances. Since we’d only be shooting at 200 yards, I adjusted the dial with my DOPE for 200 yards and explained the ocular lens and parallax dial. I went over how wind affects a bullet’s path, but pointed out that in our particular situation, we wouldn’t have to deal with wind much. I then demonstrated the basic operation of the bolt-action rifle; how the bolt cycles, where the magazine sits, how the magazine is released, how the bolt feeds a round from the magazine into the chamber, how the safety can be switched on and off and finally how a proper trigger pull works. I explained how they should rest their cheekbone on the stock of the rifle, get a proper sight picture and adjust the position of the rifle with the shooting bag near their left hand. The right hand was tasked with handling the bolt and when taking a shot, handling the trigger. After the demonstration and explanations, I showed them how the spotting scope worked and then fired five rounds at the upper left cross mark on the lane’s target, making sure it was still zeroed. After that, it was time to hand over the reins. Mr. M was first to shoot and followed everything I said to the letter. He was placing rounds on target within 3 inches of the bulls-eye consistently. After he’d gone through two magazines (5 rounds per magazine), they called a break to change the targets and we cleaned up our table before heading downrange to see how Mr. M did. What was difficult to see in the scope of the gun was as plain as day standing a foot away from the target. Mr. M was proud of his grouping and it was pretty good, especially for someone who hadn’t shot at that distance for a couple of decades or more. The range staff replaced targets for anyone who needed them and everyone made the trip back to the firing line. 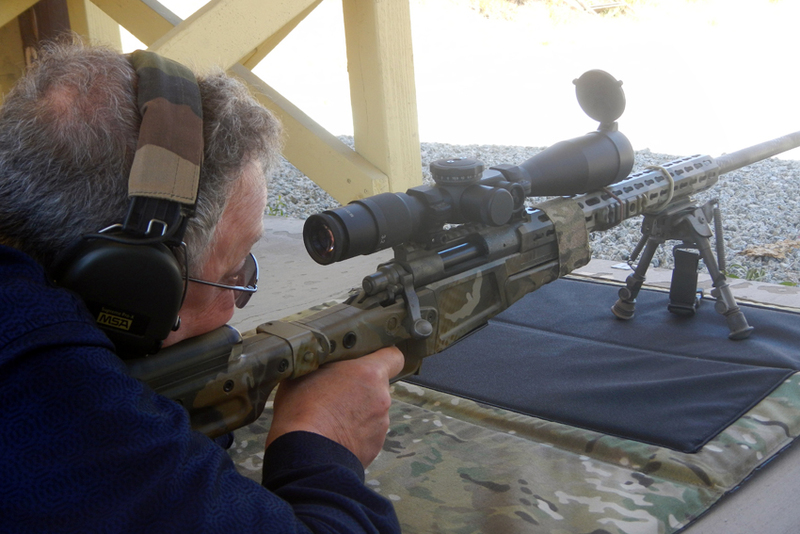 When my father-in-law was ready to shoot, I set the rifle back up on the bench and went through the basics of operation again, then took my position behind the spotting scope. I kept one eye on the target, though still watched his actions to make sure he wasn’t getting too close to the scope, for fear he’d suffer the indignity of scope bite to the forehead. His first shot went off with a little bit of surprise on his part. Though he’d felt the blast and volume of other people firing, I don’t think he was fully ready for the experience of recoil delivered to the pocket of his shoulder. 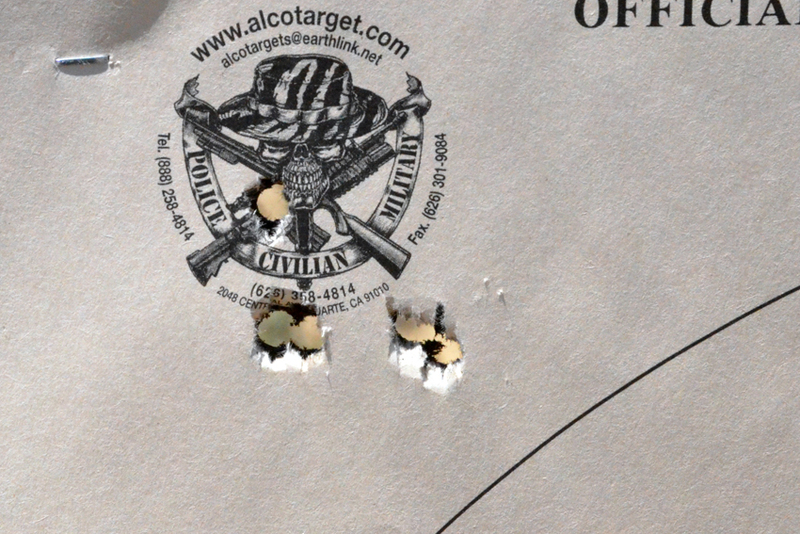 Still, the shot hit within about an inch of the center circle of the target. He continued to shoot another four rounds, all hitting within a few inches of the center. He then he wanted to try shooting prone, so I moved the rifle to the prone lane, where I had laid out my shooting mat and showed him how to line himself up on the ground. With his feet spread as flat as possible, he launched another five rounds downrange, all within inches of the first five shots. 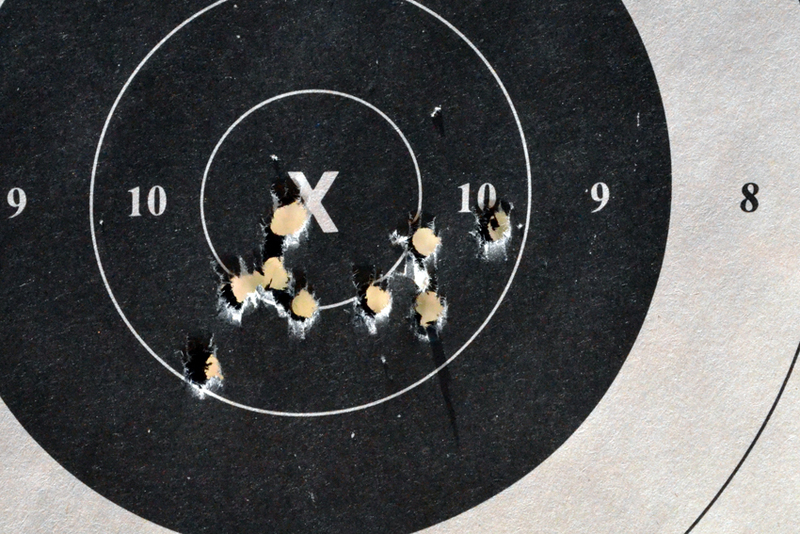 All in all, not too bad for someone who had never fired a weapon before in his life, particularly at 200 yards. After that, there was another break in the shooting period where we got to take a look at our groupings and have targets changed. My father-in-law got to see just how effective his shots were and was suitably proud of himself. He did mention that he thought it was probably just the equipment, rather than his skill. I joked that it was probably the excellence of his instruction and we returned to the firing line to resume another shooting period. Mr. M shot another few magazines, performing well again, until we got ready to switch so that my father-in-law could shoot. 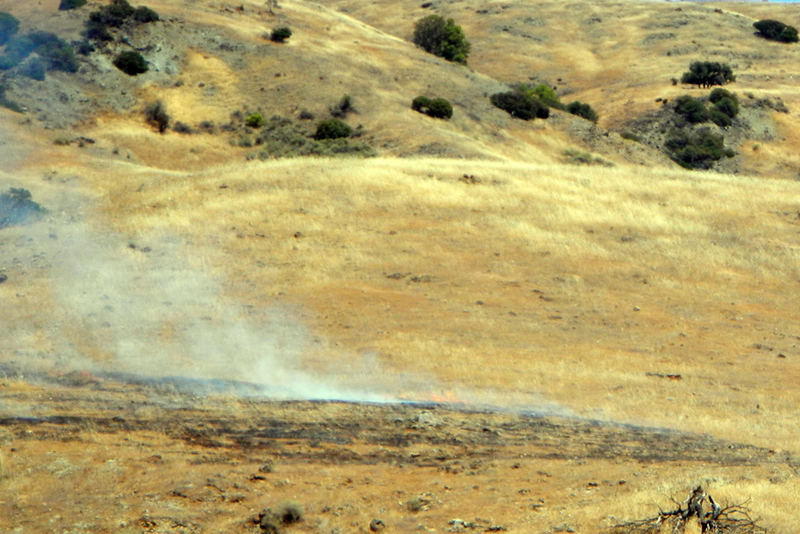 Unfortunately by that time, a small wildfire had broken out on the top of a ridge above the range to our right, probably due to missed shots from the 100 yard line hitting the rocks surrounded by dry grass. The whole range was called cold while they waited for a response from the Fire Department. Everyone milled about while we heard the sirens of multiple fire trucks coming to extinguish the blaze, followed by a circling fire airplane and finally a helicopter. 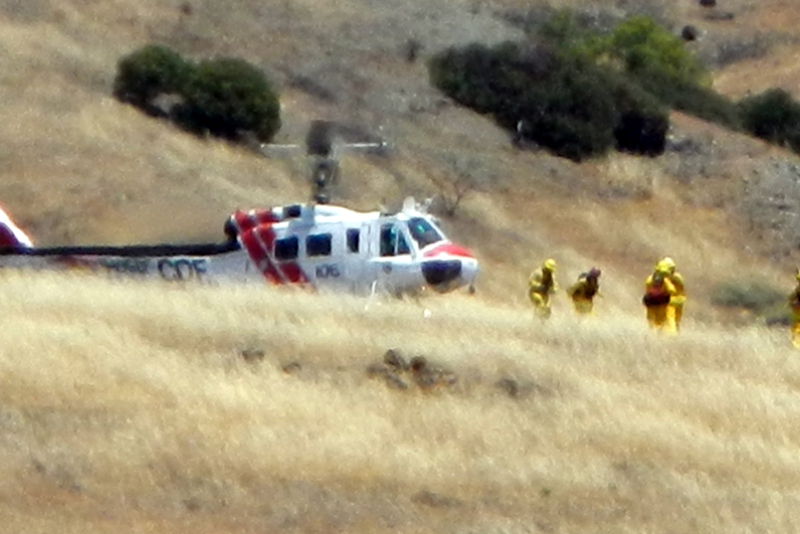 It made two drop-offs of multiple Firefighters above the fire on the next hill. The Firefighters made their way down to meet those that had arrived in the trucks, who had run hoses up from the main facilities. 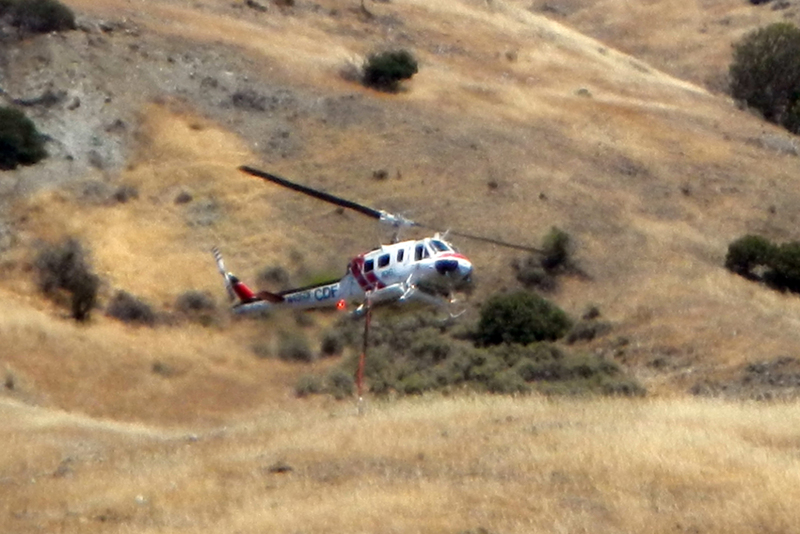 The helicopter made a circling pass above the fire to the left of the Firefighters, dropping water from the air. Eventually the Firefighters had fully extinguished the fire. Sadly by that time there wasn’t any shooting time left before the range would close and that was the end of our range day. Mr. M, my father-in-law and I loaded up, headed back to the car and went back to downtown San Jose to have some lunch and celebrate a successful, albeit short, day at the range. After lunch, I dropped them both back off at their homes. They were both pleased about the day’s events and were already making plans to repeat this trip again in the near future. I don’t harbor any illusions that this one day trip has reformed a gun control advocate’s mind on the subject of firearms, the Second Amendment or anything else, but I do feel like he better understands the appeal of shooting. It has opened a door for future trips of a similar nature, allowing me to share something I love with my new family member. I hope, over time, I can introduce him to the statistics underlying the reality of gun crime in this country and allow him to see how firearms are tools to be respected. I hope to also show him that there’s a community of responsible gun owners that’s not the same as the community of people who commit crimes with these tools. If I can show him that, hopefully I will have convinced one more person to avoid the gut reaction to kick law-abiding gun owners the next time some sociopath criminal decides to use these tools to end innocent lives. I want him to see gun owners in the best possible light and in that sense, I’m lucky to know a large number of upstanding citizens who shoot, never commit crimes and are the exact type of people you want as ambassadors for the Second Amendment. Changing minds on this subject in a political environment like that of the Bay Area is still an uphill battle. However, it’s a crucial battle and one that’s much easier won by converting individual minds through friendly, pleasant experience; one at a time, rather than through contentious, verbal altercations. I know I’m a lucky man to have won the affections of my wife and it seems I’ve also done pretty well in the father-in-law acquisition. A couple weeks later, a friend and I took another “virgin shooter” to the range for his first time shooting. In this case, our mutual friend Gary was not “anti-gun” by any stretch of the imagination. He’d just never been lucky enough to go shooting before, so he was looking forward to it possibly a bit more than my father-in-law had been. 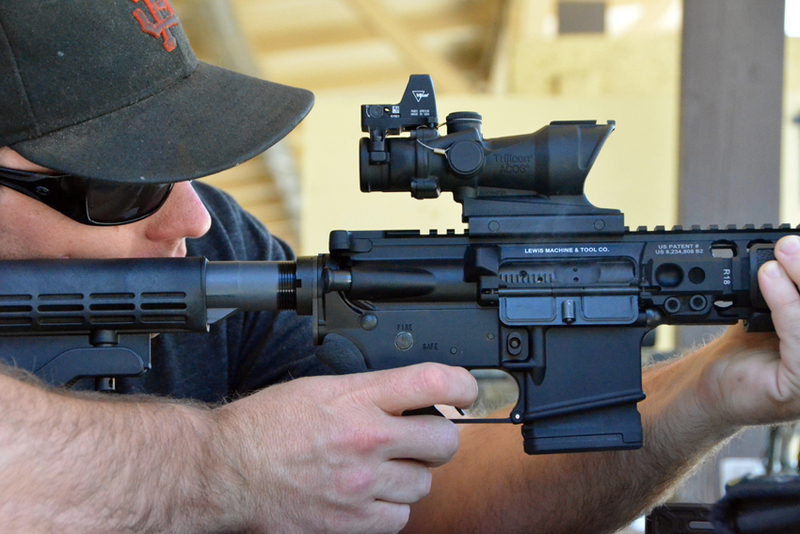 On this particular trip, we took my R700, an AR-15 and a few pistols in order to give him as well-rounded of an experience as possible. Since the 200 yard range line was closed that weekend, we started off having him fire the Remington from the 100-yard line. Again, we went through the preliminary safety briefing, the basics of how ammunition works, how the rifle works and how the scope works. 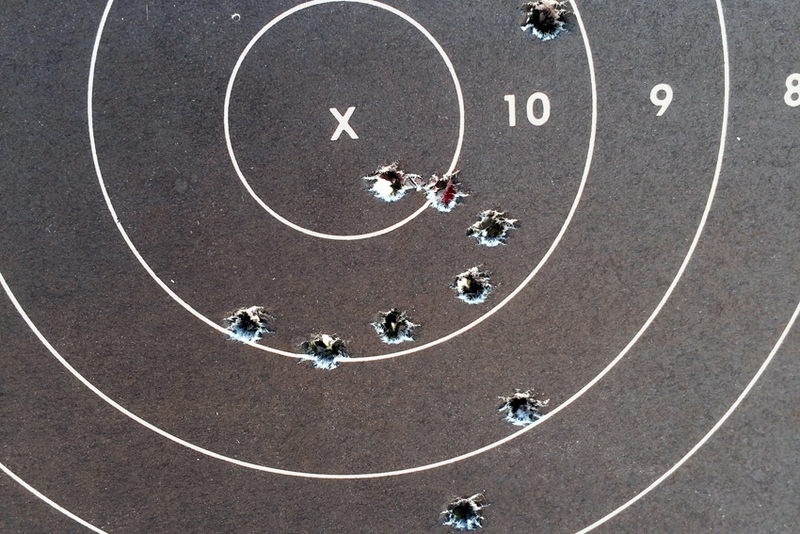 He was immediately hitting the target with pretty good “first time shooter” groupings. 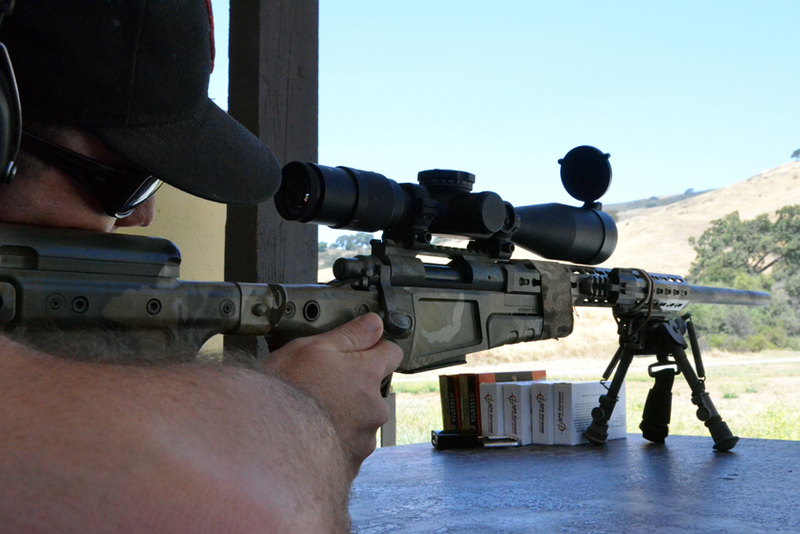 After a few magazines’ worth of .308 through the Remington, we moved him to the AR-15 at 50 yards and although the groupings there weren’t as tight, he took to the mechanics of operation with relative ease. A few magazines later, we packed up the rifles and moved down to the pistol line, shooting at 10 yards and 20 yards. 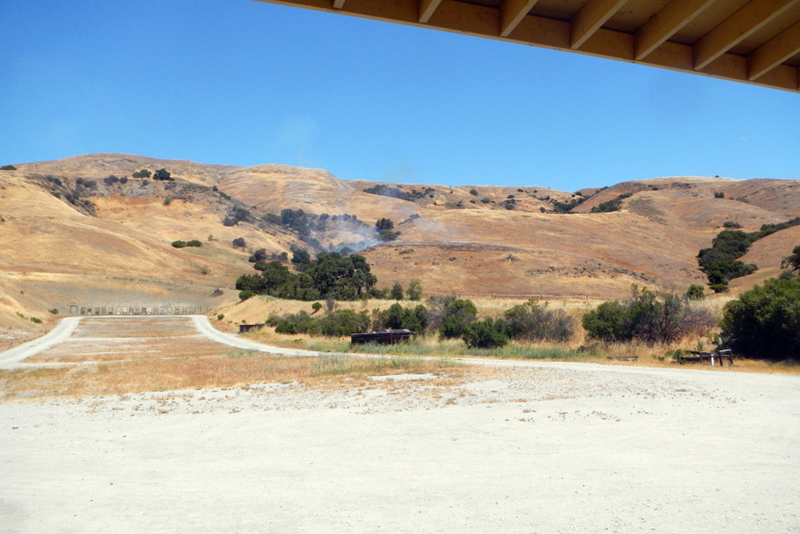 There was no fire behind the range that day, so we were able to shoot until the day was over and sent a lot of lead down-range. Gary thoroughly enjoyed himself and we jokingly congratulated him on finally becoming a “full American,” before packing up and heading back home. In my life, I’ve taken a number of people shooting for their “first time” and it’s almost always a rewarding experience. 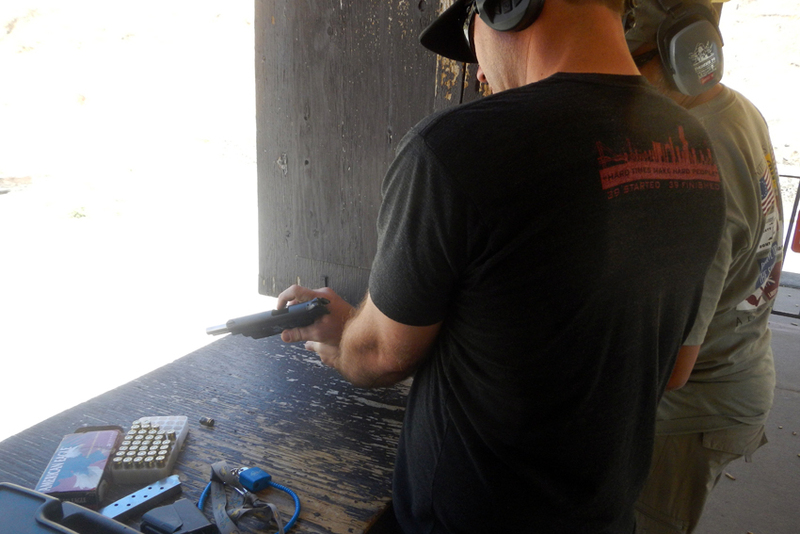 I’ve learned that I prefer to do this in a one-to-one or small group setting, as you get more done when you’re not trying to brief 10 or more people at a time about the rules of firearms safety. 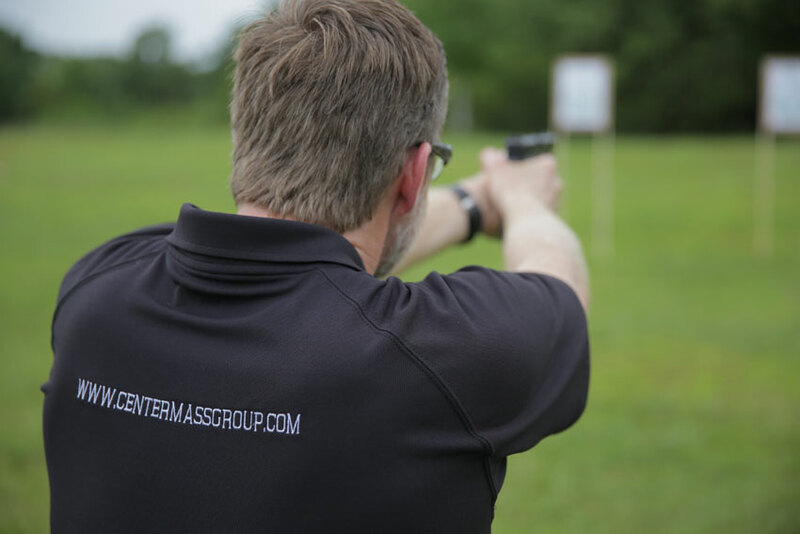 It’s also difficult to individually coach larger groups to get them hitting targets safely and reliably when you are, in effect, babysitting that group to make sure no one hurts themselves or anyone else. 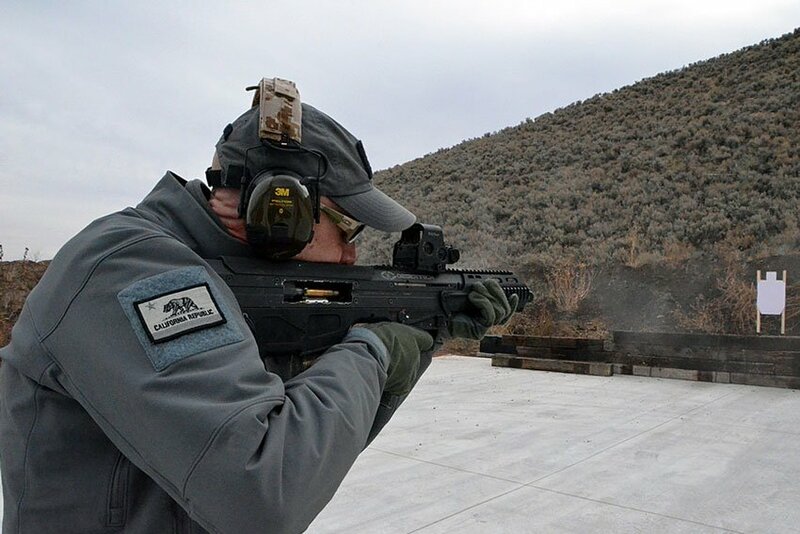 While I enjoy taking willing pro-gun newbies to the range, I think I enjoy taking the anti-gun folks to the range even more; I’ve been lucky enough to watch slow transformations of the mind happen on such trips. 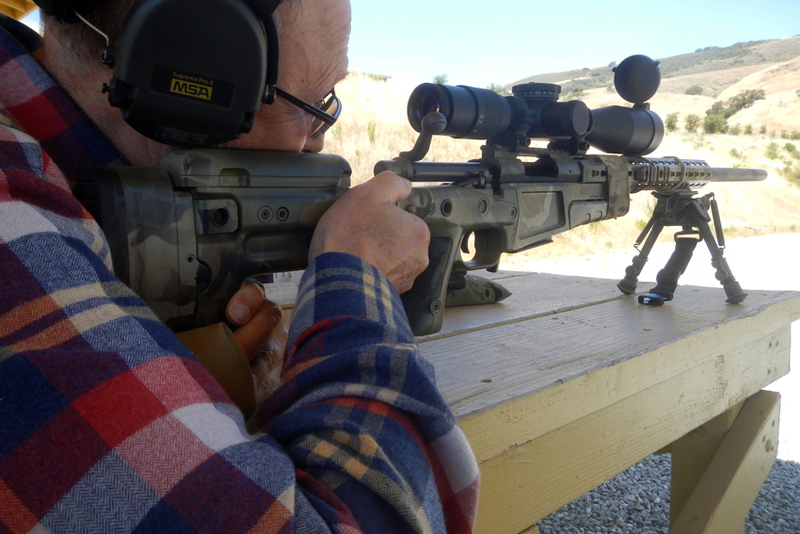 Since initially penning the first portion of this article, my father-in-law said he’d like to go back to the range, but would like to shoot at less distance and suggested possibly adding some handgun use to the experience. This is a pretty fundamental change in mindset from someone who had previously believed that civilians had no business owning weapons and I’m proud to have helped instigate that change. 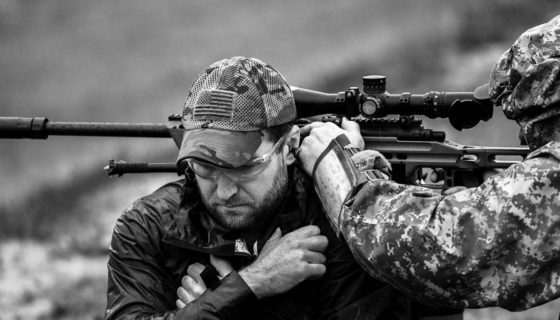 For me, providing range experiences to people is a much more effective means of changing their mind, than spending any number of hours bickering on social media platforms or in hostile conversation. 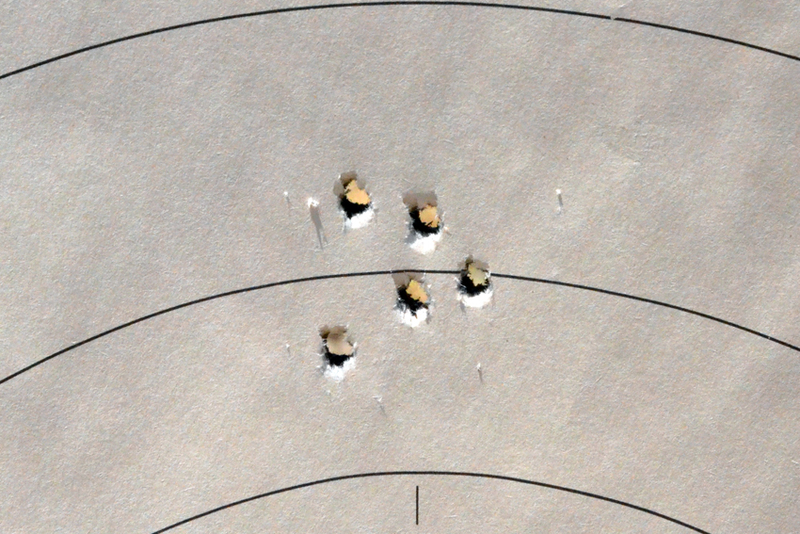 Sometimes, I’ve offered to take people to the range only to be met with stark refusals and that’s fine. You can’t change everyone’s mind and some people just simply aren’t ever going to be open to learning like that. However, taking people who are open to the experience can be enjoyable and enlightening, both for them and yourself. I’ve certainly learned with repeated experiences how best to teach them a little of what I know and if I someday have children of my own, I hope to use that experience to transfer that knowledge to them. In addition, teaching them the importance of the Second Amendment to our Constitution and what it means as a guarantor of all the other freedoms we enjoy in the United States. 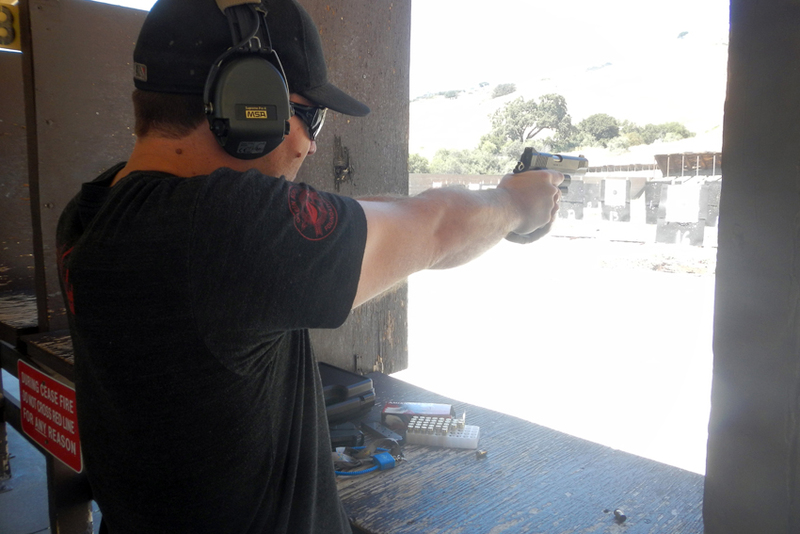 If you know someone whose mind you’d like to change about firearms and you feel comfortable enough teaching them how to safely operate said firearms, I highly suggest inviting them to a take a trip to the range with you. Actions often change minds much faster than words ever can and the memories you create will stay with both of you for a lifetime. 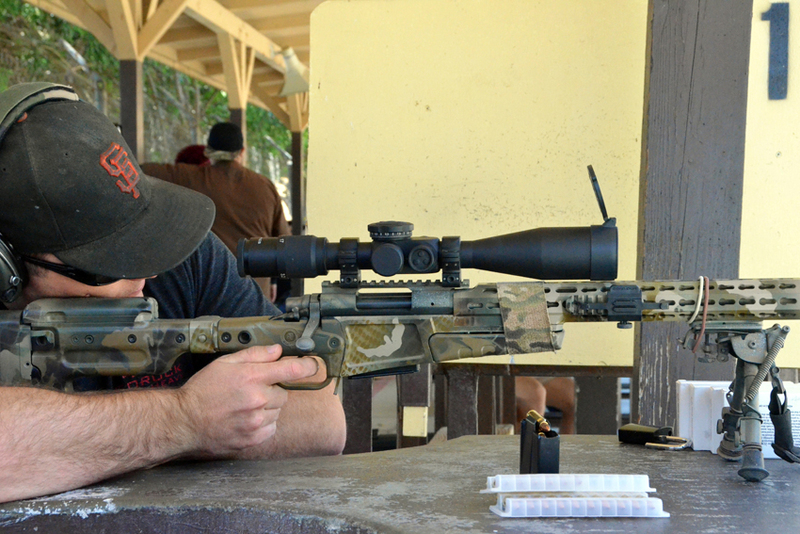 Editor-in-Chief’s Note: Matthew Sharp is a Plank Owner and Life Member at ITS and goes by the username “viator.” He lives in The People’s Republic of Northern California and enjoys long range shooting, carrying heavy objects great distances and fuzzy little puppies.